Often teams have more than one autonomous program, either for competitive reasons or for testing new software. Programs often vary by adding things like time delays, different strategies, etc. The methods to choose the strategy to run usually involves switches, joystick buttons, knobs or other hardware based inputs. With the SmartDashboard you can simply display a widget on the screen to choose the autonomous program that you would like to run. And with command based programs, that program is encapsulated in one of several commands. This article shows how to select an autonomous program with only a few lines of code and a nice looking user interface. Create a variable to hold a reference to a SendableChooser object. 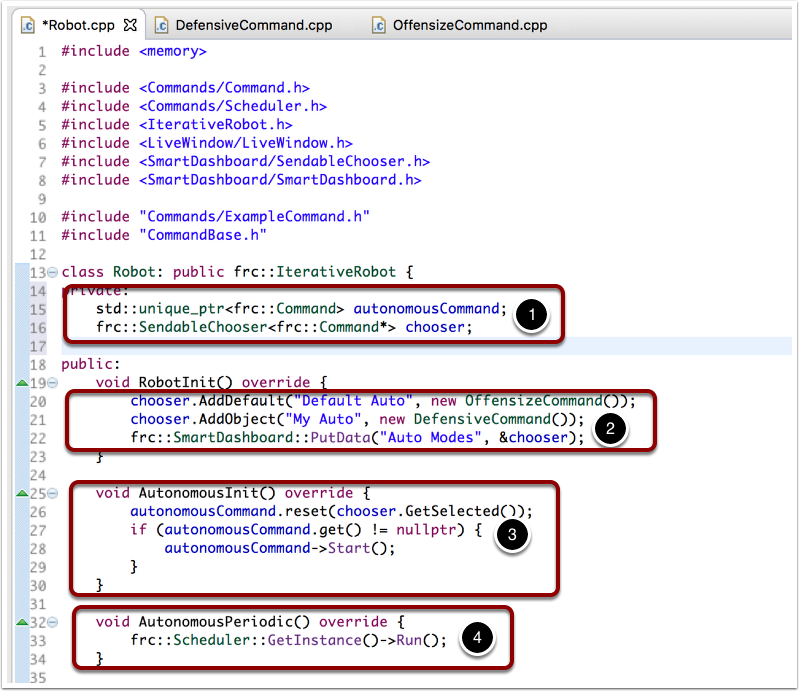 This example also uses a RobotBuilder variable to hold the Autonomous command. Create a SendableChooser object and add instances of the two commands to it. There can be any number of commands, and the one added as a default (addDefault), becomes the one that is initially selected. Notice that each command is included in an addDefault() or addObject() method call on the SendableChooser instance. When the autonomous period starts the SendableChooser object is polled to get the selected command and that command is scheduled. RobotBuilder will generate code automatically that runs the scheduler every driver station update period (about every 20ms). This will cause the selected autonomous command to run. When the SmartDashboard is run, the choices from the SendableChooser are automatically displayed. You can simply pick an option before the autonomous period begins and the corresponding command will run. Create variables to hold the autonomousCommand pointer and the SendableChooser pointer. the SendableChooser is created and initialized in the RobotInit() method. In the AutonomousInit() method just before the Autonomous code starts running, the choosen command is retrieved from the SmartDashboard and scheduled. In the AutonomousPeriodic() method, the scheduler is repeatedly run.